We all work too much. Many don’t realize how important it is to step away from the monitor and take a break. This isn’t just for your physical health, but your mental health. For some users breaks come naturally. For others, a bit of a heads up is necessary. 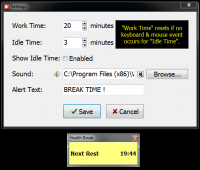 Health Break is a ‘take a break reminder’ software for long-time computer users. You do not have to test the limits of your eyes, your hands, or your sanity. 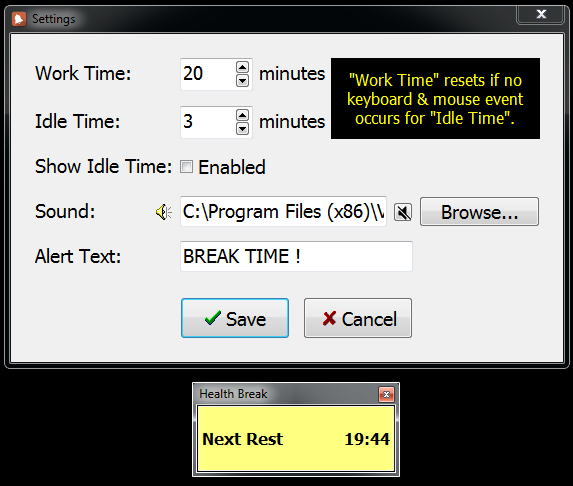 Use Health Break to ensure you take a break during long days of computer usage. I got this the last time it was here. Time goes so fast that it takes an app to remind me to take a break. I can’t always stop when an hour is up, but I try to find a stopping point as soon as possible after the alert. Breaks keep me from getting too cramped in one position and maintain good circulation. I set the “work time” and the “idle time” for 60 minutes each. When the break screen pops up, I hit “keep working” and the app resets. Leave the “show idle time” unchecked. I changed the “alert text” to “stand up” which gives me a command and instead of the description “break.” If I am eating, etc., I just leave the break screen sit there until I’m ready to work again.